Now that we’re officially in transition mode, my wardrobe has started to take on a decidedly more autumn-themed tone. Since I’m not quite ready to pull out the tights just yet, denim has been on steady rotation over the past couple of weeks. These jeans (last seen here) have been a staple thanks to the fact that they go with everything. I’m also a still a big fan of the stripe detail, which has proven to help pull a lot of looks together while providing a little extra touch! If you’re looking for fun new denim this fall, you’ll definitely want to check out Old Navy’s skinnies sale that goes from now until October 2nd. They’re an ideal way to make an everyday statement, and you can’t beat the price point right now (they start at $19)! Great hat and sweater! Comfy and cute!! Hi beautiful, I just discovered your lovely blog! I’m obsessed with all of your pretty outfits, and I’m just loving this sweater. Keep in touch! 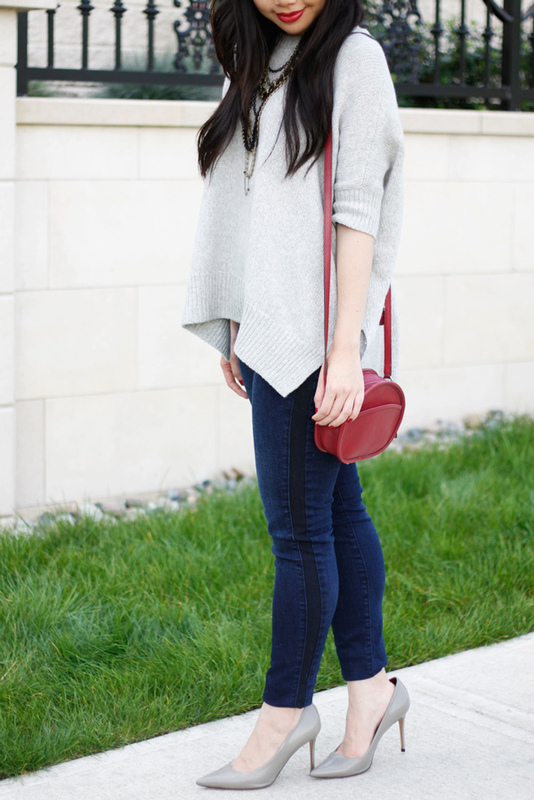 Old navy skinnies are the greatest, I have several pairs and they are so incredibly comfy! What a gorgeous red lipstick! What is it?